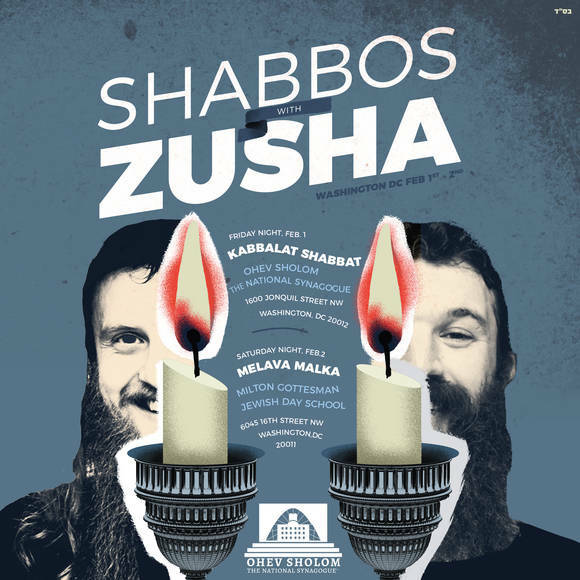 This Shabbat, we celebrate the third of four consecutive weeks of Bat Mitzvah celebrations. This means we will have a different schedule of services Shabbat mornings. For more information and to read a letter from Rabbi Herzfeld and Maharat Friedman, please click here. Mazel tov to Josie Silverberg on her bat mitzvah! We welcome her family and friends joining us to celebrate this Shabbat. This week's Kiddush Luncheon is sponsored by the Gershman/Silverberg family in Josie's honor. We are saddened to annouce the passing of Rabbi William Fertig, father of Sarah Fertig Trauben, father-in-law to Steven Trauben, and grandfather to Sasha and Judah Trauben. Visit ostns.org/lifecycle for shiva details (logged in members only). We are saddened to annouce the passing of our member Joseph Spund. A graveside service will be held tomorrow (Friday, January 18) at 11:30am at Ohev Sholom Cemetery. We extend our condolences to Rabbi Ethan Seidel of Tifereth Israel Congregation on the passing of his father, Barry Seidel. Visit ostns.org/lifecycle for shiva details (logged in members only). Women's Tefillah We are pleased to present a calendar of upcoming Women's Tefillah gatherings here. Additionally, we are updating our database of skilled leiners and daveners. Please add your davening and/or leining skills to this document. If you wish to be added to the Women's Tefillah e-mail list please contact info@ostns.org so we may update your account. 2018 Tax Statements were emailed to members last week. If you did not receive this email or would prefer a paper copy by mail, email info@ostns.org. Help Sponsor Kiddush & Dessert for Anna Yuter's 106th Birthday: On Shabbat, February 2, we will join together as a community to celebrate Anna's 106th Birthday. Please join us in honoring Anna's milestone by co-sponsoring kiddush/dessert. Suggested donation of $120 (ad me'ah v'esrim) but any donation of any amount is appreciated. Please make your donation by 1/28 at ostns.org/donate (include Anna's Birthday Kiddush in the notes) or by calling the front office. In response to the current partial government shutdown, Yad Yehuda is offering interest-free loans to federal employees affected by the furlough. More information may be found atyadyehuda.org/furlough-loans. 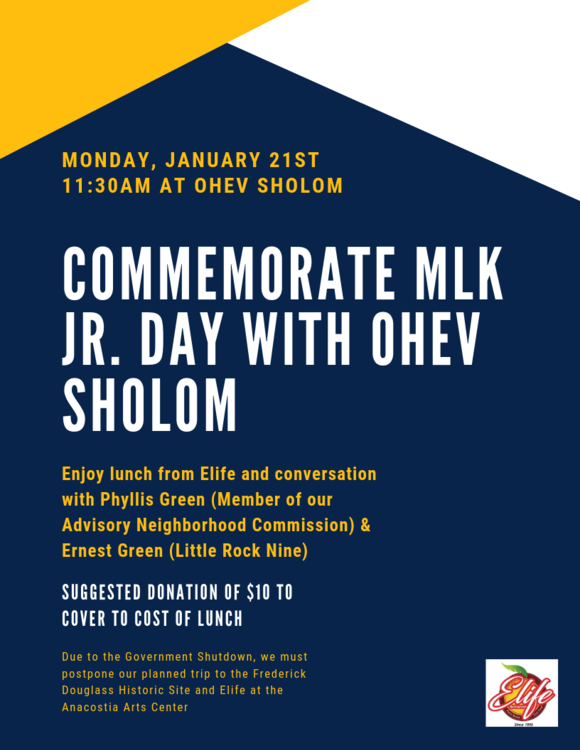 MLK Jr. Day Program Change - Join us at Ohev on Monday! In this week's Parsha, Beshalach, the Jewish people begin their journey from Egyptian slavery to the Promised Land. The Parsha includes the crossing of the Sea of Reeds, the drowning of the Egyptian pursuers, and the Songs of Moshe and Miriam. The Parshah concludes with the attack of the Amalekites. A high point of the Parsha is the Song of the Sea, Shirat Hayam. Moshe begins his song, saying, "I will sing to the Lord, 'ki ga'o ga'eh'." These Hebrew words have traditionally been translated, "because he has triumphed gloriously." However, in his new translation of the Hebrew Bible, the scholar Robert Alter translates "Let me sing unto the Lord for He surged, O, surged." He bases this translation on a study of the Hebrew words, here and elsewhere in the Torah. One may wonder whether this new translation has contributed to Biblical understanding and appreciation. When the Jewish people emerged safely from their crossing, the sea closed in on the Egyptian pursuers, who began to drown. The Talmud tells us that the Ministering Angels sought to sing a song before God. God responded, “My handiwork are drowning in the sea and you want to sing a song before me?” (Sanhedrin 39b). We learn of God's concern for all people. Some rabbinical sources explain that in the prayer service during the intermediate and last days of Pesach, we omit two paragraphs of Hallel because the drowning of the Egyptians took place on the Seventh Day of Pesach. This fundamental ethical concept is also stated in the Ashrei prayer, Psalm 145, which is included in every morning service. "The Lord is good to all, and His mercy is upon all His works." (Verse 9). The Haftorah, from the Book of Shoftim, echoes the Parsha. It, too, includes a song -- the Song of Deborah, the Judge of Israel, celebrating the victory over the Canaanites. The Haftorah also includes the story of another heroine, Jael. Jael entices the Canaanite general, Sisera, into her tent, where she kills him by hammering a tent peg into his temple.. Deborah sings, "Most blessed among women is Jael . . . At her feet Sisera sank, lay outstretched where he sank, there he lay, destroyed" ( Judges 5:24 and 27).